This pilgrimage is meant for those persons who seek inner solace through Buddhist values and philosophy. You will have the rare opportunity to visit all the important Buddhist temples and get blessings from important Lamas and Rinpoches. Be a part of the Thimphu Tsechu, one of the largest tsechus or religious festivals in Bhutan, according to attendees from surrounding remote villages. Bond with the locals as you watch the Black Hat Dance during Cham (religious masked dances) and witness the rolling out of the huge Guru Padmasambhava Thankha, a festival tradition. In addition to participating in the Tsechu, there are also opportunities to learn the basics and obtain a better understanding of Buddhist meditation. Sacred Bhutan lets you leave the material world behind and delve into your inner being, your spirit. On arrival at the Paro Airport, you will be met by our representative who will drive you to your hotel. After lunch, you are free to relax. At an orientation dinner you will be briefed about the upcoming tour activities. Overnight in hotel. After breakfast, visit a Rinpoche for a talk on Buddhism and Meditation. After Lunch, excursion to Taktshang Monastery. Taktsang Monastery (Tiger’s Nest): The Paro Taktshang is one of the country’s most famous tourist attractions. The trail to the monastery climbs through beautiful pine forest, and an occasional grove prayer flags. It is said that Guru Padmasambhana, the tantrum mystic who brought Buddhism to Bhutan , cam in the form of form of Dorje Droloe riding a flying tigress to subdue the evil and demon that were obstructing the spread of Buddhism in the Himalayas . Visit the temples inside the Monastery and get blessings of the religious books. If the head lama is available get blessings from the Lama. Then visit the Kyichu Lhakhang. Kyichu Lhakhang: This temple is one of the oldest buddhist temple in Bhutan. The Tibetan King, Songtsen Gompo, to consecrate the entire region of Himalaya, in the 7th century miraculously built 108 temples. Kyichu Lhakhang is considered to be one of them. Dinner and overnight in hotel. Changangkha Monastery: This monastery is built on a hill overlooking the Thimphu valley. It was built in 15th Century by Lama Phajo Drugom Zhipo. Many parents of Thimphu take their their new born babies to this monastery to be blessed by a high lama. After lunch, take an excursion to Tango Monastery. Tango Monastery: The monastery was founded by Lama Gyalwa Lhanampa in the 13th century and was built in its present form in 1688 by Tenzin rabgye, the 4th temporal ruler. After driving for about 20 minutes we have to steep hike about approx 1 – 1.5 hrs to reach the monastery. Zhabdrung Ngawang Namgyal meditated in its cave in the year 1616. Light butter lamps and get blessings at the Monastery. In the evening, do Chotern kora (Going around the Chorten (temples and stupas) chanting prayers and counting prayer beads) at National Memorial Chorten. Dinner and overnight in hotel. After breakfast, celebrate Thimphu Tsechu (festival). Apart from a time to wear beautiful fineries, eat good food and socialize, the tsechus imparts religious values, It is also believed that the mask dances in the tsechu is also guidance to the people on earth about after life. For many Buddhist it is very important to witness every event of the festival. A local monk shall be arranged to explain about all events in detail. Dinner and overnight in hotel. A local monk shall be arranged to explain about all events in detail. Dinner and overnight in hotel. Stop at Dochula for installation of prayer flags and a short prayer in the Dochula temple for the well-being of all the sentient beings. Drive to Punakha and visit the Chhimi Lhakhang enroute. Chhimi Lhakhang: This temple is located on the way to Punakha. This temple is also known as the temple of fertility and was built by Lama Drukpa Kuenley in the 15 century. Lama drukpa Kuenley is also known as the Divine Madman. Light butter lamps in the temple. After lunch, visit the Punakha Dzong. Explore other religious places in and around the Dzong. Punakha Dzong: This Dzong was built by the Zhabdrung Ngawang Namgyal in 1637. It is built at the junction the Pho Chu and Mo Chu Rivers. 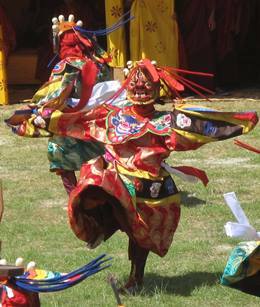 The annual Punakha Tsechhu(Festival) is held here. The monk body resides in this dzong in winter. Dinner and overnight in hotel. In the evening, free time to relax or go for Chorten kora (Going around the Chorten (temples and stupas) chanting prayers and counting prayer beads) at the town temple. Overnight in hotel. After breakfast, transfer to the airport for your departure flight onward or homebound. Arrive in Kathmandu where you will be met and driven to your hotel. Orientation dinner. Tour Kathmandu proper, Durbar Marg and try to glimpse the Kumari, the virgin goddess, waving. Tour Swayambunath, an ancient religious complex atop a hill in the Kathmandu Valley west of the city proper. Swayambunath is often referred to as the Monkey Temple as there are “holy” monkeys living in many parts of the temple. The Tibetan name for the site means ‘Sublime Trees’ as there are many varieties of trees found on the hill. This site is an important place to visit for Buddhists. In the afternoon explore Pashupatinath, one of the most important temples to Lord Shiva in the world (located on the Bagmati River) and sacred to Hindus, and Boudhanath Stupa, one of the largest Buddhist stupas outside of Tibet.. See the many Tibetan monasteries and life of the community. Visit Kopan, a Tibetan meditation center. Drive outside Kathmandu to a small village Parping and explore the sacred Guru Rinpoche Caves. The large cave is said to have his handprint imbedded in the rock. Parping is also known for its meditation retreat centers.